Hidden Cove Park & Marina Welcomes the Residents of Frisco! Frisco Is Nice, But Hidden Cove Is Nicer! Consider our park if you live in Frisco and are looking for a weekend retreat. Our park on the lake is fun for every age in your family, and we invite you to come see for yourself. Just a few of our amenities include swimming, fishing, boat rentals, camping, picnic tables and playgrounds, a hiking trail, and outdoor games. Visit our whole site for details on these activities and much more. Pack up the kids and let them experience life outside of “things that go beep”. If you are living in Frisco and need to get away, start planning a camping trip to Hidden Cove! Or you can bring a date! 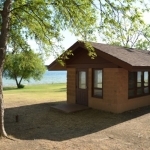 Our cabin shelters are lakeside and are the perfect way to cozy up with that special someone. On the premises, we’ve also got a full-service restaurant (often with live music), for all the grown-up fun you can ask for. We also offer canoes, paddleboats, kayaks, jet skis and pontoon boat rentals! Who would have known that all this is in Frisco, Texas?! Visit Hidden Cove if you you’re interested in grilling out, swimming in a safe area, fishing, playing horseshoes, drinking and eating at Captain Jacks, hiking, camping, and so many other things. Night or day, the fun is all happening in Frisco, and we hope to see you here!